If you do not have an online business, chances are you may not have ever heard of the term drop shipping. In this article, we will try to explain what it is and how it can make your life and running your business easier. We encourage you to read on, especially if you are about to start your own business or are looking into expanding online. Drop shipping refers to shipping directly to your customers from a vendor with no intermediaries in between. As you can tell, this is a complete opposite to the traditional model where you buy and store the products in a physical location. Once, they’re sold, you ship them yourself. 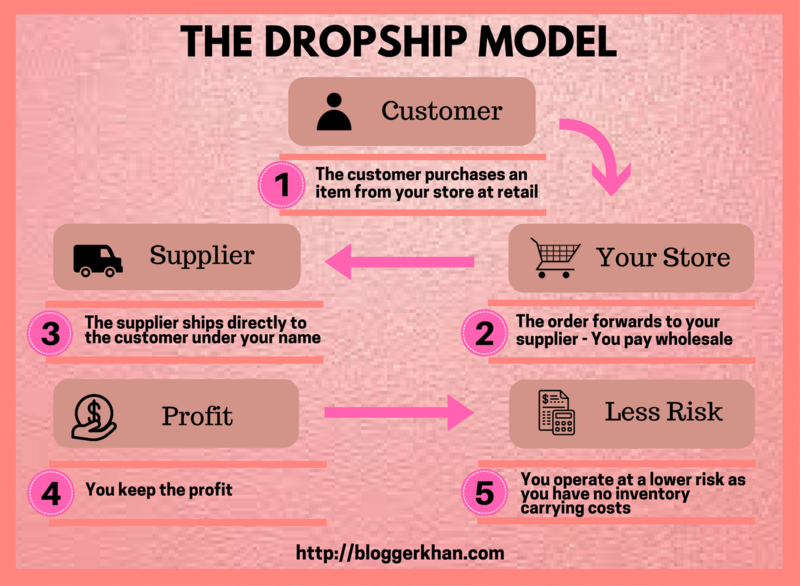 With drop shipping, once a customer orders from you, you pass the info along to your drop shipper who, in turn, packages and ships them directly to the customer. The biggest benefit is obvious, that you do not have to keep any inventory yourself. You free up both your time and resources, have a wide selection of products, you are not limited by the location of your business and your customers will receive their orders on time. It also promotes scalability which is a huge perk. On the flip side, your margins are a little slimmer as the drop shipper charges for his services. In addition to scalability, reduced risk is another major advantage of drop shipping. In a conventional model, you buy in bulk, store the inventory and then sell over time. If you make a bad decision and the market changes on you, you can be stuck with unsold inventory. That can be devastating. Drop shipping helps you lower your risk and to pay for that reduced risk, you have reduced profit margins. So, now that we have established that drop shipping is a good idea, the next question is where can you find them. A simple Google search can be helpful, but make sure you expand your search terms by using drop shipping vocabulary such as wholesaler, distributor, etc. Contacting your manufacturer may be also worth a shot as they may be collaborating with a particular drop shipper already. This will be as good of a recommendation as it can get. Before making a decision, which drop shipper to use, ask yourself a few questions, See what products they provide, at what cost, what shipping and payment options they offer, what is their return policy, etc. Do they offer any branding recommendations and send email notifications with order status and tracking? During the research process, it may definitely be worth your time to check any reviews and references they have received from their customers online. Let us take a look at two of the most popular Chinese websites, Alibaba and AliExpress. Alibaba has a wholesale, business to business model, requires minimum order quantities and sometimes the goods are manufactured after your order. So, it may take up to several months from order till delivery. On the other hand, AliExpress works as a retailer, with a business to customer model, it allows the purchase of single units and the products have already been manufactured so shipping is done in a more timely manner. Alibaba is a platform that sells in bulk, that is, the sellers on Alibaba sell in bulk. They are either manufacturers or wholesalers / distributors. AliExpress is a platform for retailers though it also has some drop shippers / wholesalers who give you bulk pricing if you are a bulk buyer. Then there are drop shipping aggregators who serve as the middleman between drop shippers and ecommerce merchants making it easy for both parties to further their business. Here are a few drop shipping aggregators: Oberlo – importing from AliExpress and other Chinese manufacturers; Doba – they interface with both manufacturers and wholesalers; WholeSale Central – an aggregator with a decent tool for filtering through categories like apparel, electronics and leather goods; Dropship Direct – another significant aggregator. How can you integrate them with your ecommerce system? To integrate the drop shipper with your ecommerce platform / online store, contact a web development company like InterloperInc.com that specializes in ecommerce. They have several years worth of experience with both ecommerce development and drop shipping and work professionally and in a timely manner to meet the business’s needs. Once you have all these streams of product data flowing into your ecommerce system, you may also consider uploading your inventory to marketplaces like Amazon, eBay, Walmart, Sears, Rakuten etc. To upload and synchronize inventory, you may use services like UploadMyProducts.com to make life easier for you. All these services are there to help you make buying, selling and processing orders easier. Your focus then has to be on generating traffic to your website, servicing customers and doing research on what product mix to carry.